Nancy and I have always enjoyed wine and our tastes have changed over the years. In 2007 we decided to take a class at College of the Canyons together. I won the coin flip and I got to choose the first class. I chose Food and Wine Pairing I. Nancy at first complained as she said all I wanted to do was drink wine in class and take a course that was not very academic. Actually she was right, but she had the last laugh. This turned out to be one of the hardest classes we had ever taken. We had to know all the major regions and many sub-regions in France, Italy, Spain and California. We also had to learn all the wine laws in all countries, as well as learn the basics of how all the different styles of wine are made. I thought I had enough after the one class but she chose as her class the next semester the advanced Food and Wine pairing class. Well to make this long story short we completed the Wine Studies Program in 2011 and received our wine studies certificate of completion. Due to this wine education I was asked to write a bi-weekly wine column for the Ventura County Star Newspaper in 2008. Nancy and I made our first wine out of some backyard grapes we were able to acquire. We made about two cases and it was god awful. However we got the bug and we ended up making our wine at local wineries in Ventura County. From one of my early interviews I had met Chuck Ortman a legend in winemaking. We still needed grapes for our 2009 and I had asked him to keep his ears open for us for some Pinot Noir, our favorite varietal. The call came in early summer of 2009. Chuck said he could get us 3/4 of a ton of grapes from Riverbench Vineyards from the famed Mesa Block. We produced 38 cases of 2009 Pinot Noir. Our 2009 Pinot Noir received a Good+ rating and value icon from PinotFile and a 90 rating from PinotReport. Since then we have made and sold Pinot Noir from Santa Maria Valley, Sta. Rita Hills and Oregon’s Willamette Valley. 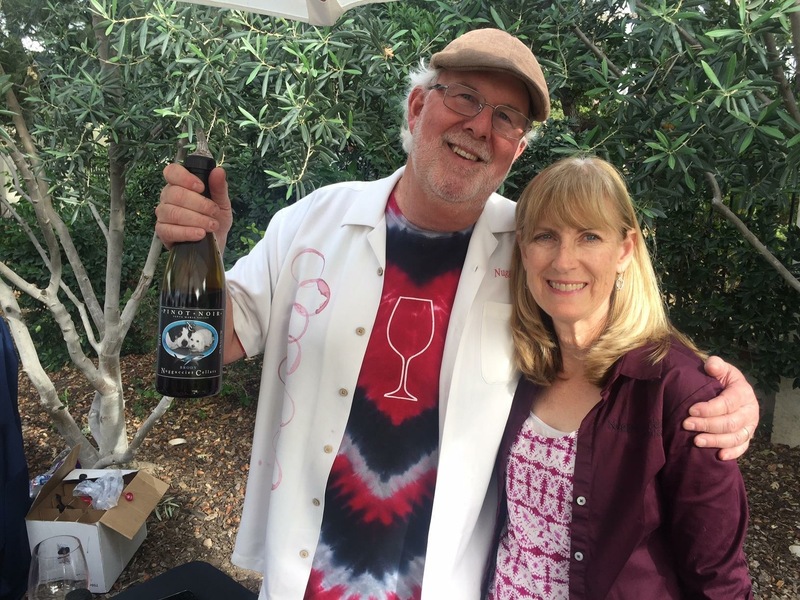 Our Pinot Noir’s have won Gold and Silver medals at the Orange County Fair and Nuggucciet Cellars has received 90 plus ratings on all of our Pinot Noirs through 2013. The 2013 Riverbench received a 92 rating and the 2013 Clos Pepe received a 91 rating from Wine Enthusiast.. The name Nuggucciet is pronounced “NEW” GAA” “SHAY” and is named after our two dogs Nugget and Gucci.